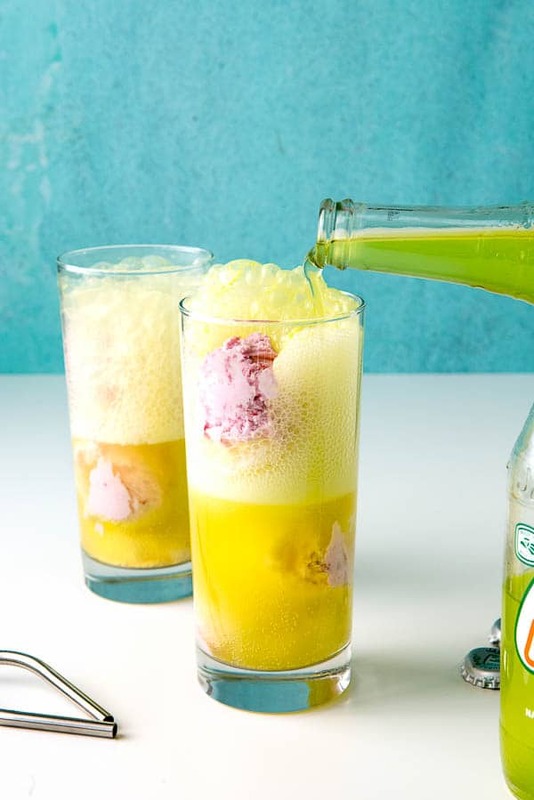 Ice cream floats with strawberry ice cream and lime soda are a refreshing summer dessert. 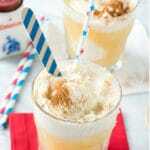 Easy to make and fun to eat, this ice cream floats recipe will be a favorite for everyone. It still seems a bit risky to post summer classic dessert right now. While some areas are starting to see signs of spring, Colorado enjoyed a foot of snow closing the airport and stopping mail delivery this week. 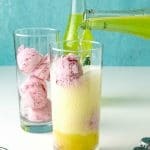 I just can’t resist the springy colors of these Strawberry & Lime Soda Ice Cream Floats so here it is! My first memory of an ice cream float was on a family trip to Wyoming to go river rafting. We joined some other families I did not know and shared cabins that were charming and rustic. 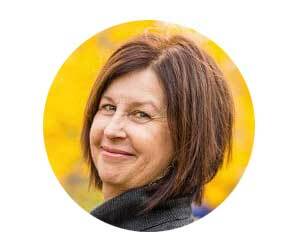 I remember wandering with the other kids around the dusty cabin-stead between raft trips and visiting the small log cabin style snack bar. We weren’t big soda drinkers and one of the girls I’d paired off with offered me some ‘mountain dew’ in the cap of a plastic bottle lid. Having never heard of it I really thought it was mountain dew gathered in the early morning from leaves in the forest. I was enchanted with the color and the whimsy though of course eventually realized it was a soda pop. One afternoon after a lovely raft float trip, watching for beavers, fish, deer roaming in the tall grasses next to the river banks we all went to the snack bar for a root beer float. 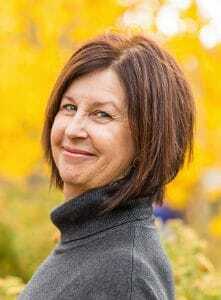 It was my first and much like the ‘mountain dew’ experience I was smitten. The mix of the root beer and vanilla flavors from the ice cream were like nothing I’d tasted and so refreshing. I was fascinated by the foaming action when the root beer was poured into the glass when hitting the ice cream. 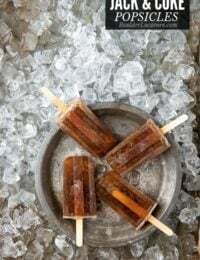 The crusty texture that would overcome the outside of the scooped ice cream when doused with root beer was something I loved. It started a life long love affair. Ironically for all this I don’t make or eat ice cream floats all that often. Not sure why but when I do make them they are always special. Strawberries and Cream Floats and Bourbon Orange Soda Cherry Vanilla Ice Cream floats are two of my most recent favorites. I love the flavors of lime and strawberries together. A Strawberry Ice Cream Lime Soda float seems a perfect combination. 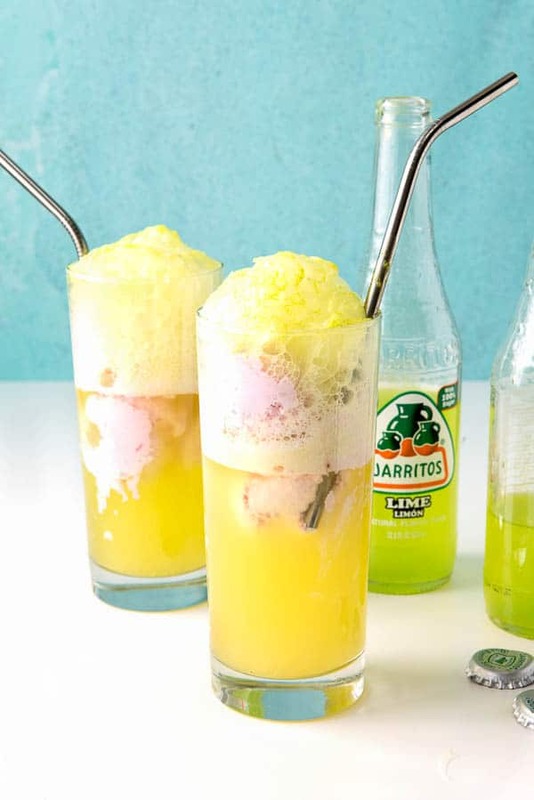 Though any lime soda can be used, I love Mexican sodas as they generally use actual sugar and I adore the bright colors. 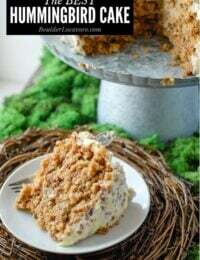 This combination tastes like warm weather so until it settles in, we can dream of it with this dessert! ICE CREAM FLOATS TIP: I like to pre-freeze the ice cream balls beforehand, which makes putting the floats together super quick and the ice cream melts more slowly as well. Use a good quality ice cream serving scoop to make the ice cream balls uniform in size. The flavors of strawberries and cream are quintessential and a homey summery combination. 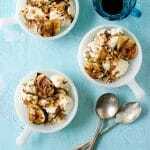 This ice cream floats recipe is perfect in any season and easy to make with only two ingredients. Ice cream balls are pre-frozen which allows the ice cream to stay firm in the float longer and is great when preparing them for a crowd. 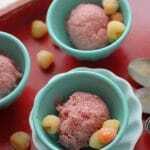 For this recipe a softer style ice cream works best to allow easy scooping into balls. Typically this ice cream is found in larger containers versus the pint size of gourmet ice creams that are much more firm when purchased. I found approximately 27 2-inch diameter ice cream balls will yield from a 1 1/2 pint container of ice cream. This equates to about 3 ice cream floats worth of ice cream from each 1/2 pint of ice cream (3 ice cream balls per float). Scale your preparation of ice cream balls according to the number of ice cream floats you plan to make. The total time noted below reflects the freezing time for the ice cream balls of minimum 2 hours. The flavors of strawberries and cream are quintessential and a homey summery combination. 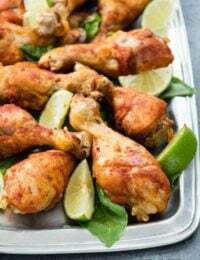 Line a baking sheet (or multiple sheets depending on the quantity you are making) with wax paper, parchment paper or sticking plastic wrap. Using an ice cream scoop, scoop balls of ice cream (2-inches in diameter) onto the prepared baking sheet. Place in the freezer immediately and leave until the ice cream balls are firmly frozen 2 hours minimum (can leave them overnight). 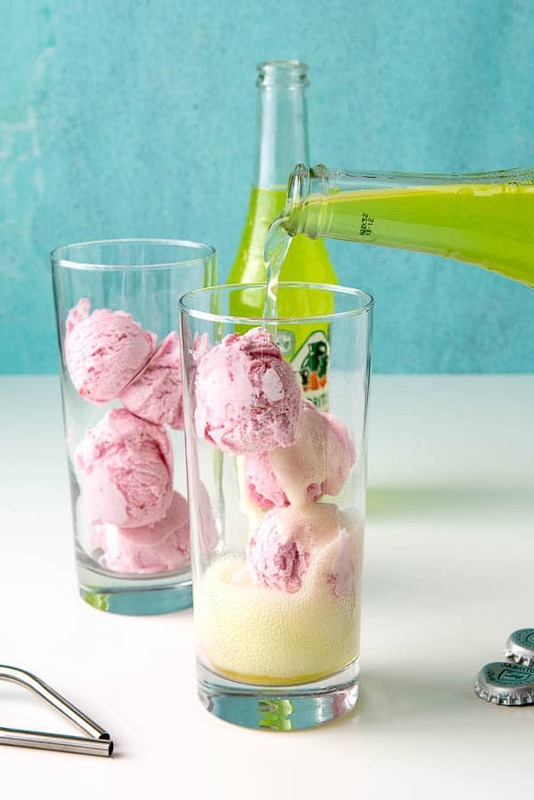 Place three to four ice cream balls in a 12-14 ounce Collins glass and fill with cream soda. Tip: pour some lime soda and wait for the foam to subside before pouring more. Fill the glass in this manner to avoid overfilling. What a fun float. I would love to try this with the lime soda too! This float is a delicious recipe idea. I will have to give it a try this weekend. My kids are going to love it. Wow! It really amaze me. I would love having this because i love lime lemon soda plus the ice crea. This is really good idea. That sounds like a really yummy drink! Our kids would love a drink like this! 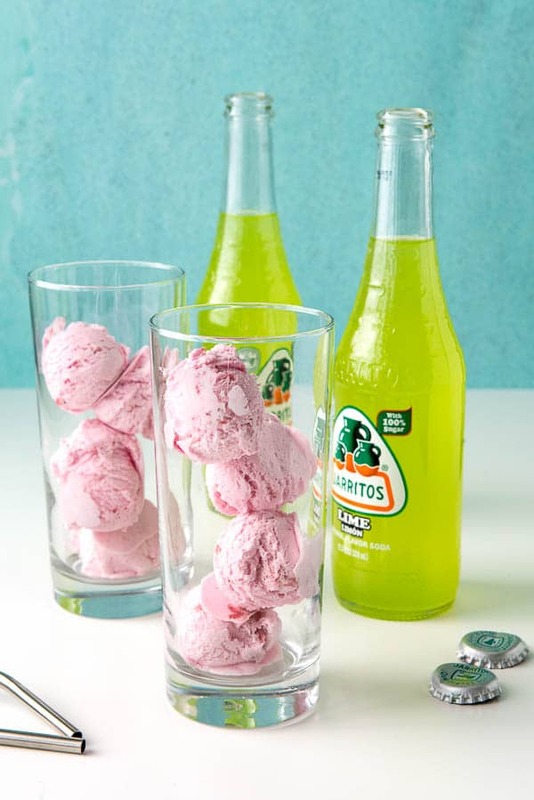 One of my all time favorite sodas mixed with Ice Cream, what could be better!! And its almost always warm enough if Florida for a float! 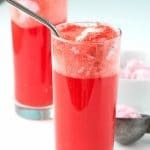 This does look like a refreshing summertime drink! 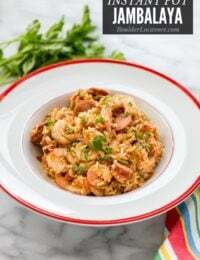 The strawberry and lime combination is one of my favorites, so I can’t wait to try this recipe! I love this combination too. Not sure why it took me so long to combine it into an ice cream float! Seemed so obvious once I had. I always liked floats as a child. I think I will share this with my niece. 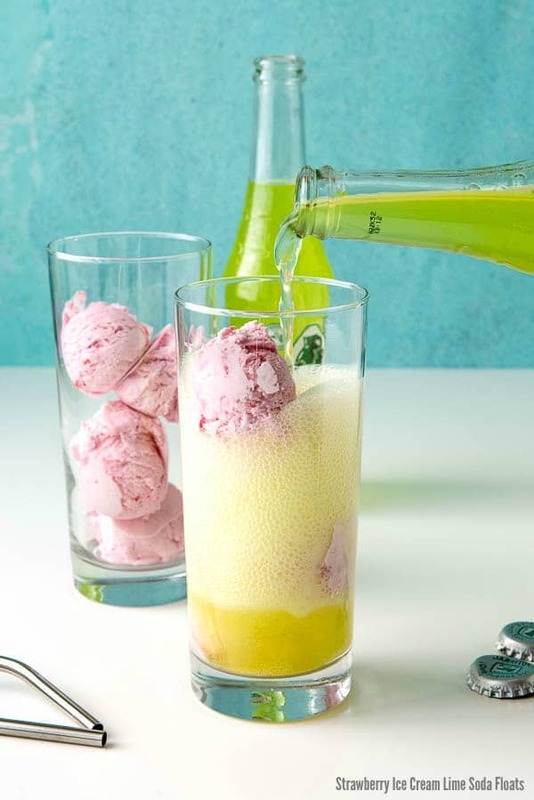 I love the thought of creating unique ice cream float combinations! Mexican sodas are definitely some of my favorites and I feel you can really taste the difference. I could go for one of those right now! It’s a gloomy & chilly day, so a happy summer-themd treat would lift my spirits. These sound like the perfect spring or summer treat. 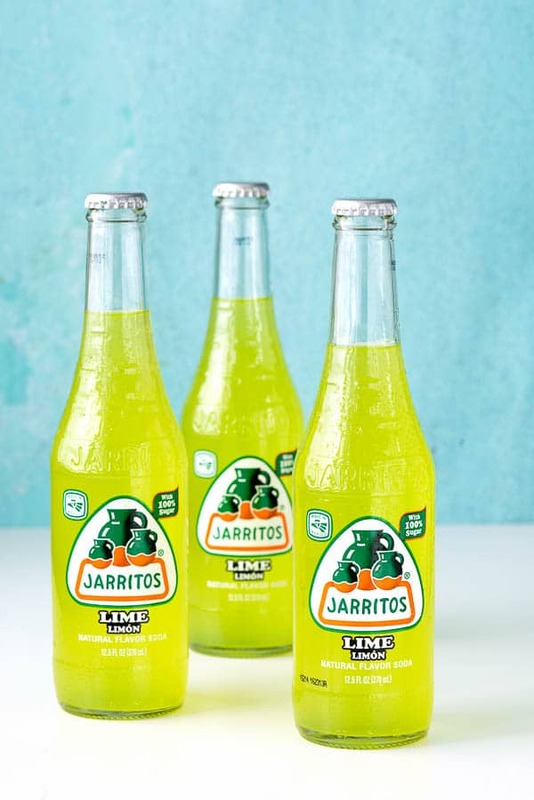 I love Jarritos soda! My favorite is the pineapple, but lime is great too. I haven’t tried Pineapple, Pam, will have to now! Thanks. Now these look good. I wouldn’t mind making a couple for my boyfriend and I to try out. I Love both strawberry and lime flavors! The “spring” or as I say, POLLEN season is about to give way to summer and this is a delicious looking way to cool off. OMG these are awesome. 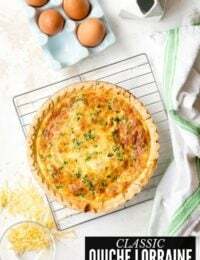 I HAVE to make these and SOON! This looks so good! What a great beverage for a hot & humid day! 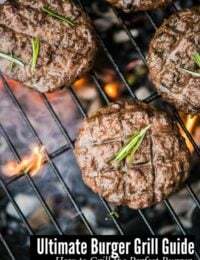 Those look fantastic! I love floats, but the same old vanilla ice cream/root beer combo was getting old. I can’t wait to make up one of these for myself. Thanks! Waaw,.. Something to be tried best in summer,.. Its freaking hot here and this will surely make everyone happy,..